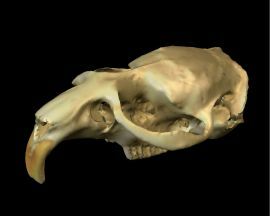 We continue our streak of cephalic mammalian updates with the skull of a —Muskrat. Muskrats, as their name would imply, are members of the rodent order, however they are not a species of rat. These animals are medium sized (0.7-1.8 kg) and semi-aquatic. They are native to North American but have invaded much of Europe and Asia. They get their name from an odor they produce from two scent glands that they use to mark their territory. You have to register to add a comment.